Living Conditions: Koi live in freshwater ponds, both indoors and outdoors. The pond needs a filter system to remove the fish waste and ammonia from the water. They live in a wide temperature range, the minimum is 40 degrees F. The optimal range is 60 to 75 degrees F.
Feeding: Summer: Feed a quality high protein Koi food. Koi fish need a high protein food to bulk up and grow during the summer months. Spring and Fall: A quality wheat germ based Koi food. 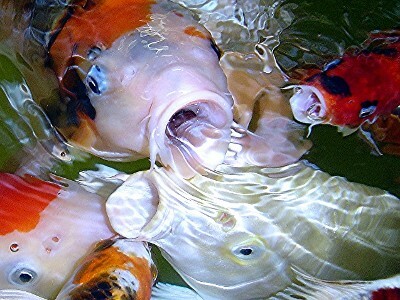 Wheat germ based foods are easy for Koi to digest. Do not feed Koi if the water temperature drops below 52 degrees F, their metabolism slows down and some food can sit undigested inside them. Life Expectancy: The average lifespan of a Koi fish is 15 to 20 years. Some can live to be 30 years old or more. Health Issues: The most common health problem is ulcers. If a Koi get hurt and the injury gets infected, an ulcer will appear. Ulcers are treated with an antibiotic dip. Other maladies that affect Koi are finrot, parasites, viruses and malnutrition. New Koi should always be quarantined before combining them with the rest of your collection to prevent any disease outbreak in your pond. Breeding: The male fish will ram the females to encourage them to expunge their eggs. The female Koi expel their eggs on vegetation or special breeding mats. The fertilized eggs then hatch after one or two weeks, depending on the water temperature. Origin: Koi fish were bred by rice farmers in Japan, who wanted to see if they could bring out the spots of color that would sometimes appear on their food carp. Koi fish, also known as the swimming jewels of the Orient, are kept in outdoor ponds all over the world. The hobby has flourished in the past few decades, creating one of the most unique and interesting niches in the world. Each year, thousands of ponds are constructed in backyards. Koi keeping in itself is an art form, use this website to expand your knowledge. This is a free, educational site with up-to-date information on Koi fish.